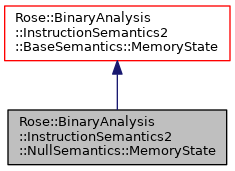 This memory state does not store any values. Read operations always return (new) undefined values. Definition at line 199 of file NullSemantics2.h. Definition at line 213 of file NullSemantics2.h. Definition at line 218 of file NullSemantics2.h. Definition at line 230 of file NullSemantics2.h. Definition at line 232 of file NullSemantics2.h. Definition at line 238 of file NullSemantics2.h. Definition at line 241 of file NullSemantics2.h. Definition at line 249 of file NullSemantics2.h.